Second Year Pays Off for Makar - College Hockey, Inc. Returning to school led to dramatic improvement on and off the ice. Only one player nationally has improved his point total, year-over-year, more than Cale Makar (+27). 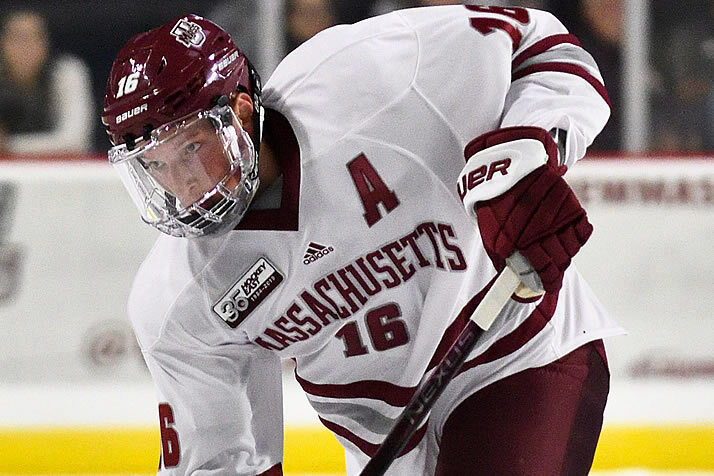 Cale Makar was hardly just another NCAA freshman last year, turning heads as a top-five NHL draft pick. But as Makar skates toward the 2019 Hobey Baker Award, it’s easy to forget that he was just a third-team all-league selection as a rookie. His second year on campus has been a historic one thanks largely to his dramatic development as a player. That, according to Makar and head coach Greg Carvel, was the plan all along. That second year isn’t typical for a top-five draft pick; the last one to spend two years in college was James van Riemsdyk 10 years ago. Makar was selected No. 4 overall by the Colorado Avalanche. The result for Makar has been growth on and off the ice. “He grew up,” said Carvel. “Cale needed to grow up physically. He needed to mature. College hockey fans can see his growth on the ice every night. But Carvel points out that it goes beyond that. As a result, Makar is in position to jump right to the NHL – once he tackles the matter at hand this week in Buffalo.